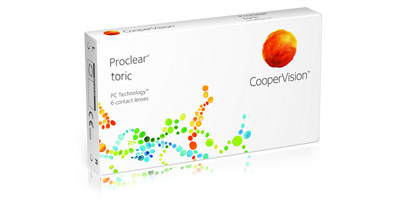 CooperVision Proclear Toric monthly disposable contact lenses offer great value for money. Made specifically to correct astigmatism, they offer relief for sufferers of dry eyes, and support eye health through biocompatible moisture technology. 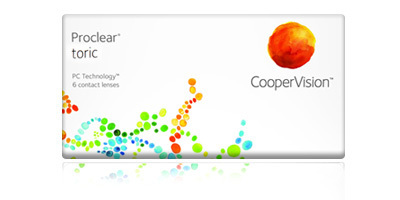 CooperVision’s sophisticated PC Technology features hydrophilic molecules, which copy the effects of the eye’s cells by naturally attracting and holding water. As water is bound to the surface of the lens, a protective layer is formed which resists protein and deposit build-up. 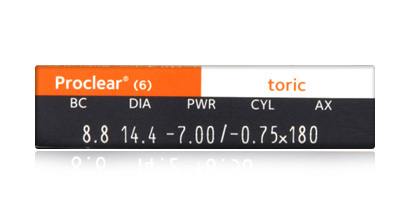 PC Technology allows for a more natural and comfortable lens wearing experience. Higher levels of water retention also allow the eye to breathe better, as more oxygen can pass through the lens to the cornea. Call one of our friendly and knowledgeable advisors on 0330 088 3133 for advice on selecting the correct contact lenses for your vision. 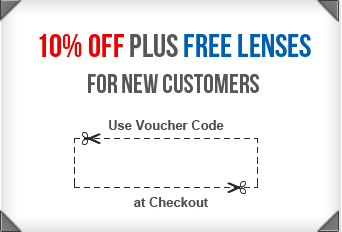 It would also be helpful if you had a copy of your contact lens prescription to hand.